When a family hosts a foreign "exchange student" in their home, some of the unusual things he does, like sleep in the pantry, are chalked up to just being a "cultural thing", but when he slips away one day with little more than a goodbye, the family is left wondering about the curious way he departed and what he left behind. I'll be the first to admit, I know that Shaun Tan is brilliant, but I've just never "got" his work before. The book Eric may be diminutive in size (in addition to being its own book, it also appears in the collection Tales from Outer Suburbia), but it is packed with meaning and wonder, while being much more accessible and easier to follow than some of his other works. In fact, I think I may say that it is quite delightful. 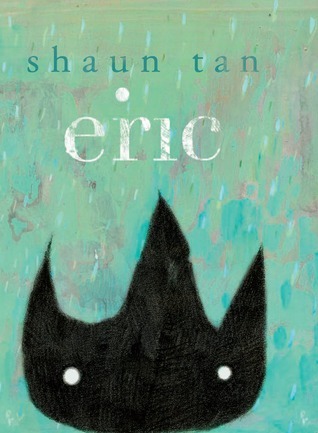 I highly recommend that Eric be a gateway into the works of Shaun Tan. It isn't quite as avante garde as his other stories and is therefore a good starting point to ease into some of his more unusual and head scratching works. For those of you who live in the U.S. like me however, you're going to have to order it from The Book Depository though because it is a U.K. title, or you could just order or check out a copy of Tales from Outer Suburbia where Eric also resides as one of the 15 illustrated short stories. Audience: ??? I'm not sure there's a defined audience for Shaun Tan. YA maybe? The cover is cute. I'm reminded of the dust bunnies in Totoro. And the concept behind the story sounds like fun.